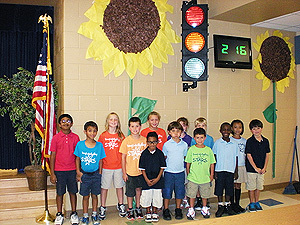 The Grassy Hill Elementary School in Minneola, Florida, has nearly 1,000 students. You can imagine the cafeteria can be a hectic place. On special request, Multicom wired up a microcontroller and wireless remote to a traffic signal light in the school’s cafeteria to ‘stop the madness’! On behalf of Grassy Lake Elementary we would like to thank you for your generous contribution to the traffic signal for our cafeteria. Your work is sincerely appreciated. The purpose of the traffic signal is to create a more structured environment during lunch. We have almost 1,000 students in our school and the cafeteria can be very noisy and chaotic especially for the adults that monitor the students. With the help of donations from supporters such as you, we will continue to grow as a family. Thanks again for your generous support of our efforts to have a more structured environment during lunch.